*** I received samples of the new PEEPS Sweet Lemonade and Bubblegum, Summer varieties, for the purpose of this feature. No other compensation was provided. All images are copyright Momma Told Me Blog 2013. Momma Told Me: There's nothing like a tall glass of lemonade in the middle of Summer! Traditionally Wednesday posts are often light and fluffy, especially during the Summer when we bowl league on Wednesdays and are often scrambling between school and meals. Today I decided to take a little foray from the 'usual' structure to share a little post I've been holding onto for a few weeks. Consider it a sort of 'Summertime is here' declaration. Though the topic of today's post is certainly sweet and fluffy, one of the most important aspects of today's product feature is the philanthropic cause it supports; Alex's Lemonade Stand. Before I go into what this charity is all about, I have a few sentiments of my own to share. When I was barely 4, many of my readers know, Momma was diagnosed with Stage 4 Hodgkins Lymphoma (cancer). While I'm certain the adults in my life did their bet to keep me blissfully ignorant as to the purpose of Momma's long-term absence, I do recall visiting her in her hospital bed that Easter. You seem for me, PEEPS have never been an 'Easter' treat, and they're more of a plaything than edible wonder. Everyone has their favorite, bunnys vs chicks, pink vs blue; but to me, PEEPS made memories. As we pranced those colorful little marshmallow critters across Momma's bedside desk I became entirely unaware of the confusion and fear I had felt when first entering. I cared not that we all had been forced to scrub and wear gowns, or that Momma's long, beautiful blonde hair was now gone. I was simply a little girl playing with her marshmallow friends and Momma. I share this memory in hopes of connecting with you on a more personal level. It is my firm belief that, as great as 'cancer' foundations are, we need to stop labeling cancer by it's cause. Whether it affects the breasts, colon, skin, ore what-have-you, cancer is a an unwanted guest in our bodies and lives. No matter where it resides, a cure is called for each and every kind. So, while I generally 'poo poo' specific cancer organizations, in an attempt to support cancer research of ALL kinds, there is one charity and cause that is particularly close to my heart. As a child I had a parent with cancer, and it was terrifying; I can only imagine the fear that must grip the parents of children fighting this disease- or the bravery called for when facing this foe in your youth. Believe it or not, Alex's Lemonade Stand is founded precisely as it sounds. A brave 4 year old girl, fighting childhood cancer, asked her parent's to set up a front yard lemonade stand to help raise money for the doctors who fought so hard to cure her. 4 year-old Alexandra Scott, while fighting cancer, raised over $2000 in one day, with a little help from her older brother, and a considerable amount more in the years that followed. Sadly, Alex passed away at the age of eight, but her legacy did not end. In 2005 Alex's Lemonade Stand Foundation for Childhood Cancer was founded by her parents, who have helps to raise awareness and funds (over $60 million) in the years since. Now you can spread a little extra sweetness by picking up the limited edition Summertime Sweet Lemonade PEEPS at a local store near you. A portion of all profits for these special little chicks will go directly to the Alex's Lemonade Stand non-profit organization! 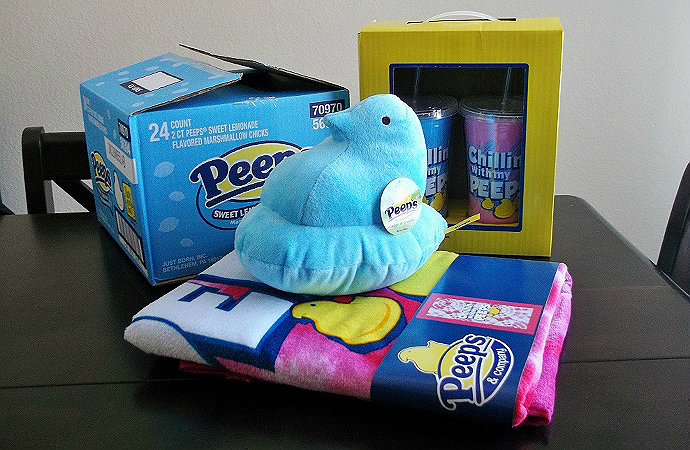 Whether you're a PEEPS fan or not, this is a wonderful cause; pick up a surprise package for the PEEPS lover in your life, or one for every kid you know. Be sure to tell them it's much more than a sweet little marshmallow, it's hope for millions of children fighting childhood cancer. Now, I know PEEPS can be a love or hate type of specialty treat- personally, I always loved playing with them much more than eating them. The plain PEEPS, with their sugar coating, were always a bit too sweet for me. When the Sweet Lemonade PEEPS landed on our doorstep for review I was immediately won over by the adorable little yellow sugar 'sparkles' that reminded me of the rainbow sparkle Anniversary PEEPS. It's now my opinion that anyone who is a fan of lemonade should hunt these down, the result is quite unexpected, with a slightly sour lemon based mallow coated in delightfully textured sugar crystals. This is a SWEET Lemonade flavor with light zings of lemon, and impressively delicate in sugar flavoring. 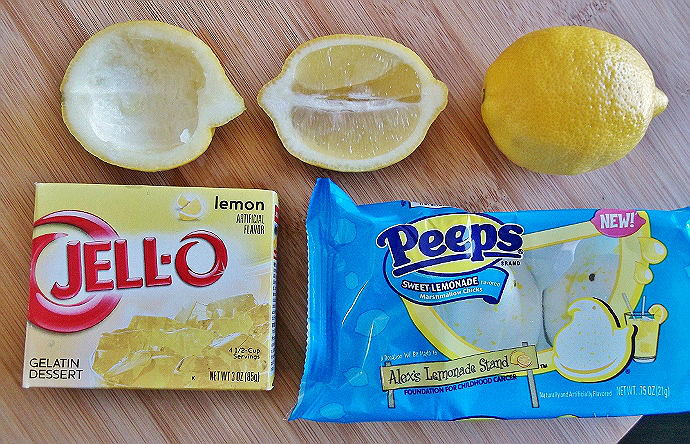 Just in case you are still thinking PEEPS are a Spring treat- I cut some lemons in half, cored them out and poured Lemon JELLO in them. 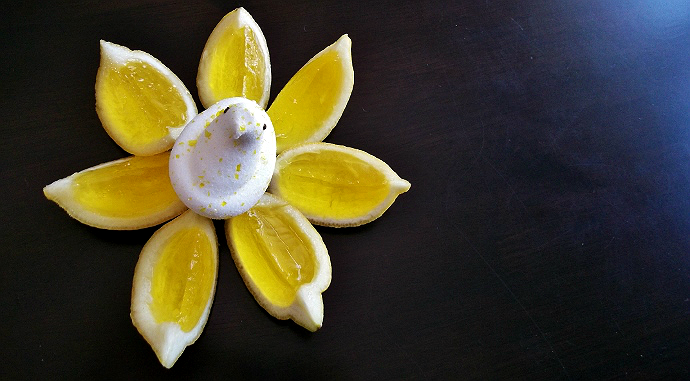 Once they had set and chilled I sliced them up into wedges and arranged them into little pinwheel daisies with Sweet Lemonade PEEPS centers. All of your backyard guests will be clamoring to know how you made these little treats, and excited to find this exclusive PEEPS Summer flavor! And, while you're at it, why not encourage your child/ren to set up their own Alex's Lemonade Stand this Summer? ****Stay tuned for the second half of our Summer PEEPS special posts, next up: Bubblegum PEEPS Cupcakes! 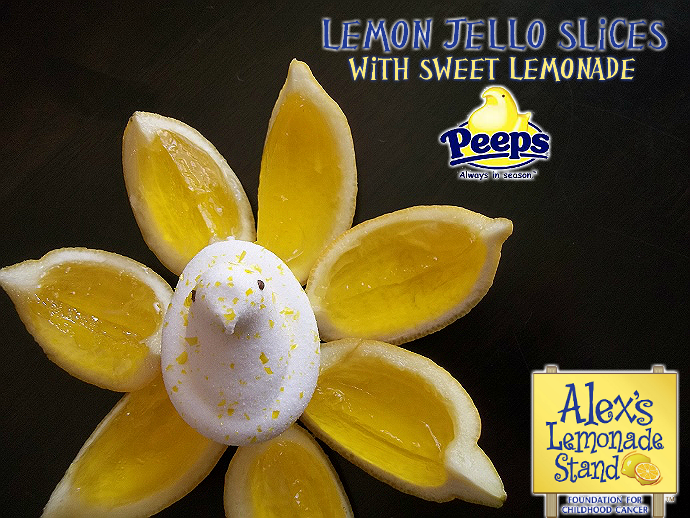 What Daughter Says: Spread the Alex's Lemonade Stand Cause and a little extra sweetness with Sweet Lemonade PEEPS this Summer! LOVE this post. I have heard about Alex's Lemonade Stand (on Chopped I think???) but didn't realize that Peeps was involved in the charity. That means a lot. 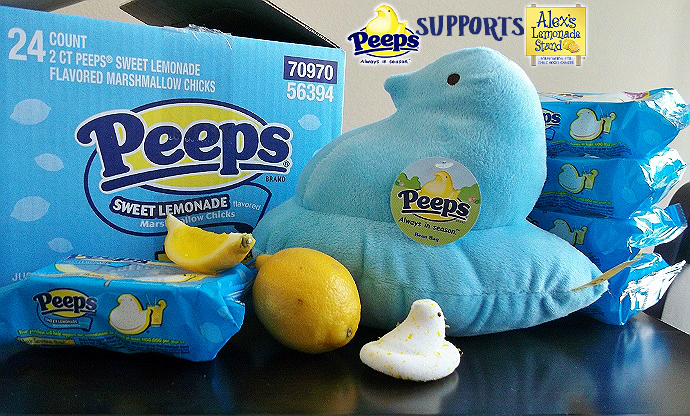 I love peeps so much and what a great cause! Such a beautiful introduction! It really tugged at my heart strings! And such special memories. And that Peeps recipe is awesome! My kids would love if I made that for it! I really like Mike and Ike. I love the Peanut Chews "friend"! Your lemon slices look amazing!! I love that idea. I like Mike and Ike. Hot Tamales are my weakness. LOVE THEM! Hot Tamales-and they freshen your breath too. I love it! So stinking cute. I really like Peanut Chews. Mike and Ike - yum! My son loves Mike & Ikes. Goldenbergs peanut chews are good! I like Hot Tamales. Thanks. I like Mike and Ike! I guess I have to say Mike And Ike :p.
I also like Mike and Ike mango flavor. I'd have to say Mike and Ike! I am a Mike & Ike freak, I keep a stash of every single flavor in my pantry! 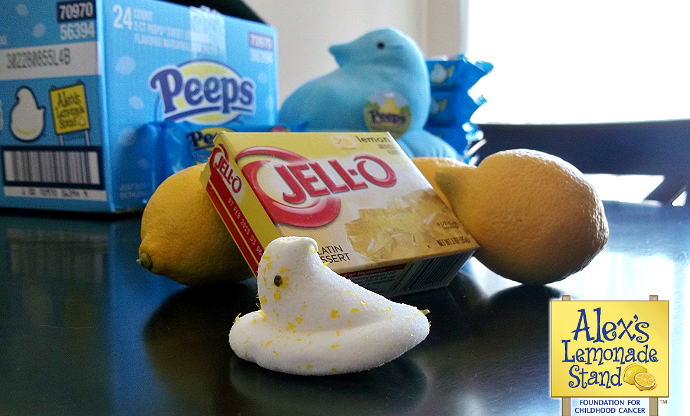 we love hot tamales and peeps! We're huge fan of Hot Tamales. Thanks so much!